Snow White Puzzle & Pop-Up Books !! All Items in Good Condition with Working Pop-Up, Open Doors, & Slide Windows. Puzzle Book is Unused ! Happy to email more pics - Just ask ! Item #1 - $27.00 -- Rare -- Snow White and the Seven Dwarfs, a Fold-Out Puzzle Book - Paradise Press, 1998. VG Condition, Hard-Board Three (3) Puzzle Book, 6 x 6-1/4 inches. LIKE NEW ! Item #2 - $ 8.00 - Disney's Snow White's Escape - Mouse Works, 1994. VG Condition, Hard-Cover Movable Acetate Windows, 20 pgs, 7-5/8 x 6-3/4 inches. Item #4 - $ 8.00 - Walt Disney's Snow White and the Seven Dwarfs, Deluxe Read-Along with Pop-Ups - Walt Disney Records / Story Teller Series. VG Condition, Hard-Cover Pop-Up/Slide Windows (no cassette), 22 pgs, 6.8 x 4.2 x 1 inches. 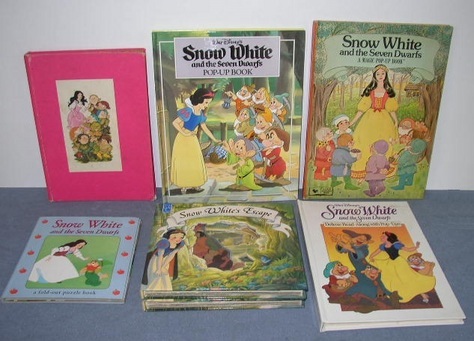 Item #5 - $ 8.00 - Snow White - Hallmark Children's Editions, Peter Seymour/ Illustrated by Arlene Noel. Good Condition (slightly worn), Hard-Cover Pop-Up/Slide Windows, 18 pgs, 6-3/4 x 9-1/4 inches. Item #6 - $ 8.00 - Walt Disney's Snow White and the Seven Dwarfs Pop-Up Book - Disney Press, 1993. VG Condition, Hard-Cover Pop-Up / Slide Windows, 12 pgs, 8-1/4 x 10-1/4 inches. See more Snow White items posted for sale in my online store !